Keyboard shortcuts are useful for accessing desktop features quickly. To optimize your experience, you can customize the current set of keyboard shortcuts in MATLAB®. Create new keyboard shortcuts or modify existing ones. Choose among available sets of keyboard shortcuts. Create customized sets of keyboard shortcuts or use existing customized sets. To view or modify the current set of keyboard shortcuts, use the Keyboard Shortcuts Preferences panel. To open the Keyboard Shortcuts Preferences panel, go to the Home tab, and in the Environment section, click Preferences. Then, select MATLAB > Keyboard > Shortcuts. For actions performed with a menu item, keyboard shortcuts appear in the menu itself. (This is true whether the menu item is in the toolstrip or in a context menu.) If a menu item does not display a keyboard shortcut, then a keyboard shortcut for the action does not exist. For actions that are not performed with a menu item, to find keyboard shortcuts, open the Keyboard Shortcuts Preferences panel. Then, in the search box, enter the name of the tool or action for which you want to see the keyboard shortcuts. For example, type Editor clear to find the keyboard shortcut for clearing selected text in the Editor. To view the shortcuts for an action, select the action name. For example, select Clear Selection. MATLAB displays the keyboard shortcuts for the selected action. For example, the keyboard shortcut for the Clear Selection action in the Editor is the Escape key. You can create a list of all the keyboard shortcuts in the current set by copying them to the clipboard and pasting them in a text file or spreadsheet application, such as Microsoft® Excel®. For the best formatting, use a spreadsheet application. To copy all the keyboard shortcuts, open the Keyboard Shortcuts Preferences panel. Click the Actions button and from the drop-down menu, choose Copy to Clipboard. Paste the data into the desired application. Customizing a keyboard shortcut is useful if you frequently perform an action and the action does not have a keyboard shortcut defined, or if the defined keyboard shortcut is hard to use or conflicts with a different shortcut. For an overview on customizing keyboard shortcuts, watch the Customizable Keyboard Shortcuts video. You must have an internet connection to watch the video. Open the Keyboard Shortcuts Preferences panel and, in the search box, type an existing keyboard shortcut or the name of an action, tool, or menu. For example, you can type Ctrl+R (shortcut), Delete (action), Command Window (tool), or File (menu). You can enter most keyboard shortcuts by either pressing keystrokes or typing the key names. If using keystrokes for a keyboard shortcut does not work, try typing the key names instead. For example, if pressing the Ctrl key and then R does not work, try typing the text Ctrl+R. MATLAB displays the list of matching actions for which you can customize or define a keyboard shortcut. If you specify the name of a tool, MATLAB displays actions associated with the tool or menu, as well as any action names that contain the specified text. Select the name of the action for which you want to define or modify a keyboard shortcut. Click the Add button . An editable text box opens in the Shortcut column. Specify the keystrokes you want to use for the keyboard shortcut. A keystroke can be a single key or the combination of a modifier (Alt, Shift, or Ctrl) and another key. Specify a keystroke by performing it, not by typing the names of the keys character by character. For example, press the Ctrl key and the Y key. Do not type C-t-r-l-+-Y. Alternatively, you can choose a shortcut from the drop-down menu. To specify multiple keystrokes for one action, or to limit the number of keystrokes for an action, click the down arrow next to the key icon in the Shortcuts box. Then, select either Limit to 1 keystroke, Limit to 2 keystrokes, or Limit to 3 keystrokes. For example, to specify Ctrl+Y, Shift+Z, F9 as the three keystrokes for an action, select Limit to 3 keystrokes and then type the keystrokes. In the Tools with shortcut column, click the down arrow and select which tools you want to assign the keyboard shortcut to. Evaluate and resolve any conflicts, indicated by the and icons. The icon indicates that two different actions within the same tool have the same shortcut. The icon indicates that two different actions in two different tools have the same shortcut. There is no requirement to resolve keyboard shortcut conflicts. However, if the same shortcut specifies two different actions, the shortcuts can be confusing to use. Resolving all conflicts indicated by the error icon is recommended, although in some situations, resolving a conflict might be unnecessary. For example, resolving the conflict might be unnecessary if the conflict is temporary or the two actions are associated with different modes of the same tool. Resolving conflicts indicated by the informational icon is recommended if you use both tools frequently and you perform both actions frequently. To resolve a conflict, change or delete shortcuts such that there is a one-to-one correspondence between shortcuts and frequently used actions. New or modified keyboard shortcuts become available immediately. Changed shortcuts that correspond to menu items immediately appear in the menu. To delete a keyboard shortcut for a selected action, select the keyboard shortcut that you want to delete and click the Delete button . If you modify keyboard shortcuts, and then decide you do not want to keep the changes, you can restore the default shortcuts. To restore the default state of a keyboard shortcut, click the Actions button and select Undo Modifications to <Set Name> Default Set (modified), where <Set Name> is the name of the modified default set. Undoing modifications reverts all keyboard shortcuts changes that you made to the set. You cannot undo modifications on a shortcut-by-shortcut basis. There are some actions and tools for which you cannot change the keyboard shortcuts. Actions for which the keyboard shortcut cannot be customized do not appear when you search for them in the MATLAB Keyboard Shortcuts Preferences panel. Examples of these actions include canceling the current action (Esc), interrupting MATLAB execution (Ctrl+C), and some of the navigational actions described in Use Keyboard Shortcuts to Navigate MATLAB. Figure windows — For example, you cannot modify the keyboard shortcut, Ctrl+S, for saving a MATLAB .fig file. Toolboxes — For example, you cannot modify keyboard shortcuts in the SimBiology® desktop. Incremental search — You can modify the keyboard shortcuts for initiating a forward or backward incremental search. However, you cannot change the keyboard shortcuts that you use within incremental search mode, such as Ctrl+Shift+S to search forward. Dialog boxes — For example, you cannot create a keyboard shortcut for the OK button. By default, MATLAB uses the keyboard shortcut settings for your current platform. To select a different set of keyboard shortcuts, open the Keyboard Shortcuts Preferences panel and, in Active settings, select from the available options. To use a keyboard shortcut settings file that is on your system but not in the Active settings list, select Browse... to find and select the desired file. This table lists the keyboard shortcut settings files installed with MATLAB. You also can download keyboard shortcut settings files from File Exchange. For example, to restore the MATLAB default keyboard shortcuts that were in place for MATLAB Version 7.9 (R2009a) and earlier releases, go to File Exchange and search for MATLAB Desktop R2009a Default Keyboard Shortcut sets. Download and extract the set and then select it as the active settings file. A valid keyboard shortcut settings file appears with a keyboard key icon . Open the Keyboard Shortcuts Preferences panel and click the Actions button . From the drop-down menu, choose the set of keyboard shortcuts to which you want to compare the current set. The Comparison Tool opens and displays the two keyboard shortcut sets side-by-side. For more information about how to read the results, see Compare and Merge Text. Save the changes you make to a default keyboard shortcut set to a new set. Use a set of customized keyboard shortcuts on another system running MATLAB. Overwrite a previously saved set of keyboard shortcuts. Share a set of keyboard shortcuts with others, for example, on File Exchange. To save a keyboard shortcut settings file, open the Keyboard Shortcuts Preferences panel. Then, click the Actions button and select Save As. MATLAB saves the file as an .xml file in the folder that you specify. You cannot overwrite the default settings files that install with MATLAB. MATLAB saves modifications that you make to a default set using the name of the default set appended with the text (modified), for instance, Windows default (modified). To delete a previously saved set of keyboard shortcuts, open the Keyboard Shortcuts Preferences panel and in Active settings, select the set of keyboard shortcuts that you want to delete. Click the Actions button and select Delete filename, where filename is the name of a keyboard shortcut set you want to delete. 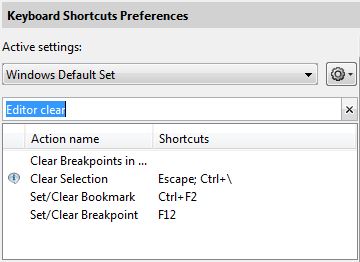 You cannot delete default keyboard shortcut sets, such as Windows Default Set.